Guadalajara is the capital of the state of Jalisco, in western Mexico. It was founded in 1542 and named after the Arabic word wadi-al-hiyara, which means "stone valley". This city, which nowadays is one of the most modern and populated of the country, played a key role in the movement of Independence of Mexico, since it was there where the priest Miguel Hidalgo y Costilla proclaimed the abolition of slavery. One of the main landmarks of the city is in the historic center, where you can see colonial-style buildings that catch the eye of any visitor. In the Zócalo you can find the main square, called Plaza de Armas, or Arm's Square, that features an Art Nouveau bandstand to listen to serenades by the State Band on some days. The Cathedral of Guadalajara features two Gothic-style towers and an adorned facade. The streets surrounding the Zócalo are home to the Degollado Theater and the Cabañas Cultural Institute, which boasts interior murals by the renowned artist José Clemente Orozco. Other important sites of the Western Pearl include Rotonda de los Jaliscienses Ilustres, or Roundabout of the Illustrious from Jalisco, the Arches of Guadalajara, the Government Palace, La Minerva Fountain, the Fountain of Immolation of Quetzalcóatl, and the Millennium Arches, a modern-style sculpture that stands out from the cityscape. 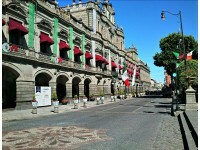 The streets of Guadalajara also offer a wide variety of modern and colonial hotels. Guadalajara owns a unique festive atmosphere, since it is the birthplace of the mariachi and charro musical styles, and you can hear bands playing in a large number of restaurants and public places. If you want to soak up Guadalajara's folklore, you should visit this city during August and September, when Encuentro International de Mariachi y la Charrería is held, a festival that takes place in the streets of the downtown area, bringing together more than 1,000 mariachi musicians and the best charro exponents in the region. For a fuller tourist experience, in the surroundings of Guadalajara you can visit the towns of Tlaquepaque and Tonalá, famous for their ceramic, wood, and hand-blown glass handicrafts. A little further north you can find Amatitlán and the Magical Town of Tequila, the main producer of the iconic drink of the same name. It is worth mentioning that the latter is easily accessible by taking the Tequila Express and José Cuervo Express® tour trains.